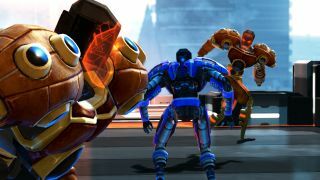 Mode 7 Games, creators of our Strategy Game of the Year in 2011 , share an update on their progress with Frozen Endzone . Welcome to the first in the series of this behind-the-scenes look at Frozen Endzone. Although it's our third game, Endzone feels a lot like a difficult second album. Our previous title Frozen Synapse had an amazing critical reception, winning awards and exceeding all of our expectations. Following something like that that is a pretty torturous soul-searching process as you try to find the needle of an intelligent decision in the haystack of random gibbering that accumulates in 4 years of making a single game. “Two years before I even started coding Frozen Synapse, I spent the Christmas break playing Chaos League 's simultaneous-turn-based mode. I was spellbound by the idea of a turn-based sports game,and absolutely loved inventing different formations and plays for every match. "Competitive geometry" might sound dry, but the thrill of both you and your opponent viewing the exact same field,but often seeing totally different things, is very exciting to me. I soon got frustrated with Chaos League's flaws--much as I did with Laser Squad Nemesis --but the idea for Frozen Endzone was born that holiday season. The first phase of making the game was to prototype the gameplay, and this happened inside Frozen Synapse itself. The mechanics, though pretty different, required the same framework to operate so this ended up being a great choice. We decided to use Torque 3D for this project mostly down to Ian's familiarity with it and the ease with which we could add new features. Our ninja freelancer Martin Johnson was brought into work mostly on rendering stuff to see if we could execute Rich's concepts. Ex-Sony animator Martin Binfield was brought in to work on early animation stuff. We wanted the robots to have a big and characterful style but also a heavy realism: it needed to be impactful when two of them clashed in a big tackle or block. Martin's distinctive animation style now pervades the game. Over the next few months, I'll be letting you know what's currently happening with Frozen Endzone as we reach beta and beyond. Follow Paul Taylor on Twitter @mode7games .